Many of us want to write fiction but rarely manage to get round to it. We struggle to find a free hour to write in – or the energy to write. Doing writing bursts is a great way to get going when time is short and motivation flagging. What is a writing burst? Every class I teach begins with a 10 minute writing exercise which I call a writing burst. I give a stimulus and ask the class to start writing, keep writing for 10 minutes and not to worry for one second about the quality of the work appearing on the paper. When the thought of sitting down and writing a whole short story is daunting, it’s much easier to find 10 minutes. Open your notebook or word-processing program of choice, write the burst at the top, then set a timer – and write without stopping or looking back. How do writing bursts help? I use writing bursts when I have very little time in the day to write, but wanted to feel I’ve achieved something. They’re also great for establishing a creative mood at the beginning of a longer writing session. You can use the material you produce as a starting point for longer pieces. One of mine became a thousand-word “twist in the tale” short story that I’ve submitted to a woman’s fiction magazine. The bursts help you to generate new or unusual ideas – I come up with more creative and interesting concepts than usual, because I don’t stop to self-edit. There are plenty of sources for writing burst prompts. The Writers’ Book of Matches, by Writers’ Digest Books, is a collection of “1,001 prompts to ignite your fiction”. The Pocket Muse: Ideas and Inspirations for Writing has some similar exercises, as well as photo prompts to help spark your writing. Competitions which give a first line can be used as writing bursts. Famous quotes can work well, so long as they’re short. Phrases or lines from a story you’ve read that inspire you are also good starting points. If you’ve tried a few writing bursts and you’re starting to get bored, the concept is open to any number of tweaks. When ten minutes starts to seem too rushed, you could lengthen the burst to fifteen or twenty minutes. If your ideas seem stale or trite, try writing with a friend: use the same prompt and swap the pieces that emerge. Alternatively, use multiple prompts – pick two prompts at random and figure out how to use them both. If you’re writing a novel or extended piece of fiction and have ground to a halt, use a prompt to get going again. You can always cut the scene out later – but it just may give your story the new life it needs. Pick one of the prompts now – you can afford ten minutes – grab that blank page, and go! Writing bursts? Hmm, never heard of the concept until now. Sounds like a great writing tool to me. I’ve been using an abbreviated version of it, like simply writing down an idea on my list of ideas. The idea may be only a few sentences or much longer when inspiration takes control. Writing bursts, also known as writing exercises, are a great way to start a new piece of fiction or help give you the creativity you need to just start writing. I love them! Another book with great prompts is the Writer’s Idea Book, one of my faves. Writing Bursts! This is a great way to put how I feel when writing the short but true stories of life to quite a large group of friends. Bursts of energy flow with enthusiasm and the words are way ahead of my fingers whilst the passion and the motivation are the driving force. Great resources and ideas – thank you. I love writing bursts, or doing some freewriting on any topic. But it does work best with prompts. I did a writing course last week and we did lots of these. They really do help you to come up with ideas you may not have thought of initially. ah, so that’s it. Writing burst. heard of ‘Writing’ and ‘bursts’, but the concept you’re trying to convey is the exact thing i’ve been doing lately. Fresh word! anyway, you’re spilling useful bright ideas. So, do you take a random word, then write sentences that come to your mind? No, its a sentence to start with, then I make up a short story, one that comes to my head from that sentence in the 10 minute time? I’ve never thought of this. It’s a good idea. I just tried it using one of the prompts above. I just wrote a fabulous little flash fiction and now ideas are just blooming! A twist I greatly enjoy is to choose one prompt and write as many pieces as possible from it. I have started doing this with “She’s been told.” and it’s a great way to test the limits of your imagination! I prefer fifteen minutes to ten, it’s just about enough time to get 500-600 words out and wrap up a scene. 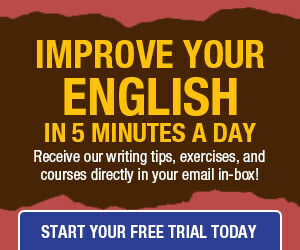 I subscribed to your DailyWritingTips.com but have not received any link to download the Basic English Grammar E-book. 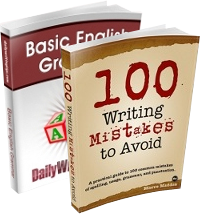 another writing practice that I REALLY love and is very challenging is to write for 10 – 15 minutes without using the letter “e” You would be surprised how many times you have to find alternative wording. What comes out from the exercise is a peice that has taken on a life of its own. You cannot tell where the next word is going to take the sentance. The most amazing part about the work you end up with is the dramatic change of your regular writing voice. I started with a lady sitting at a train stop and from the lack of “e’s” and having to improvise, I got something that sounded old and southern, just by chance. You can play around with ommiting different letters than an “e” on your next time. Try without an “a” next time. Never thought of doing that till now. I think I’m gonna talk my english teacher into letting us do this for the first ten minutes of class. Sounds fun and very, very interesting. I hope it helps my (unpublished) novel get better and better. ….And don’t forget to keep a pen and paper on your nightstand when you go to bed. I have lost a lot of ideas because I didn’t. I tried it for the first time, I’m definitely not a writer as such, but I would like to at least try fiction. I was amazed at the ideas that popped in my head and it was if I was watching a scene being played out that I could change at will. That is really cool, I’m going to keep this up and see what develops.